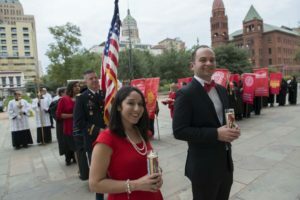 The San Antonio legal community will join together at San Fernando Cathedral on Thursday, Oct. 11, to take part in a centuries-old tradition called Red Mass to celebrate the beginning of the judicial season. At 5:45 p.m., judges and legal organizations will have a procession carrying bright red banners through Main Plaza to the Cathedral at 115 Main Plaza. The Mass will begin at 6 p.m. The event is open to the public and draws hundreds of participants each year. The Most Rev. Gustavo García-Siller, M.Sp.S., Archbishop of San Antonio, will be the principal celebrant and homilist. Martin Beirne Jr. (J.D. ’69), a member of the St. Mary’s board of trustees, will offer welcome remarks. The tradition of Red Mass dates to 1245 in Europe when both the bench and bar attended the Mass together at the beginning of each judicial session. The name is derived from the scarlet robes worn by judges and red vestments worn by priests in honor of the Holy Spirit. Red Mass is celebrated throughout the United States to request God’s blessings and guidance on the administration of justice. The St. Mary’s University School of Law and the Catholic Lawyers’ Guild of San Antonio revived the tradition 66 years ago and organize the annual event with representatives from San Antonio legal organizations, the judiciary and the State Legislature. “We will gather with ecumenical and bipartisan participation to enlighten, bless and strengthen the members of San Antonio’s legal community,” Walle said.